It looks like Nvidia’s first GTX 11-series graphics cards will be launching in the next few months, with reports from unnamed sources hinting that the GTX 1180 Founders Edition will arrive in July. This is according to people who have talked to Tom’s Hardware, and if true, it will be around two years after Nvidia launched the GTX 1080 Founders Edition, which debuted Nvidia’s 16nm Pascal GPU architecture. 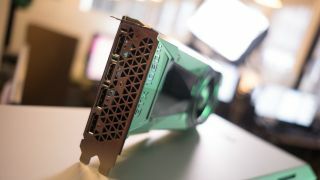 The first of the Nvidia Turing cards has been a long time coming, and according to Tom’s Hardware, the Founder’s Edition cards will come first, with third-party cards by the likes of MSI and Asus expected to follow in August or September. Apparently, laptop versions of the cards will come later in the year. According to anonymous sources, Nvidia will be delivering the GPU and memory to its partners around June 15, pointing to a July launch for the Founder’s Edition. As well as launching the GTX 1180, there's also likely to be a GTX 1170 Founder’s Edition as well, with the GTX 1180 being the flagship, and the GTX 1170 being a more affordable GPU. This follows rumors that suggest that the GeForce GTX 1180 could be faster than a Titan Xp, which is currently Nvidia’s most powerful consumer GPU. The GTX 1180 will apparently run with 3,584 CUDA cores, compared to the GTX 1080’s 2,560, with 224 TMUs (versus 160 Texture Mapping Units on the 1080) and is built on a 12nm process (as opposed to 16nm). It packs double the video RAM compared to the GTX 1080, with 16GB of faster GDDR6 memory, and the new card has a rated peak FP32 performance of around 13 teraflops. We can’t wait to see what the next generation of Nvidia GTX graphics cards are capable of, so let’s hope these rumors are true, and we don’t have too much longer to wait.